"[Leland] Lee S (Edna M) br mgr Standard Sta h1726 47th av"
This indicates that Lee S. Leland and his wife Edna M.owned the home at 1726 47th av in San Francisco, and Lee was a branch manager for Standard Stations in 1945. Alda Leland is Lee's youngest sister, and Mrs. Amelia Leland is his mother. They resided at 1287 37th av. in San Francisco. Alda rented, Amelia owned the home. Lee's father, Severt O. Leland died in 1940. 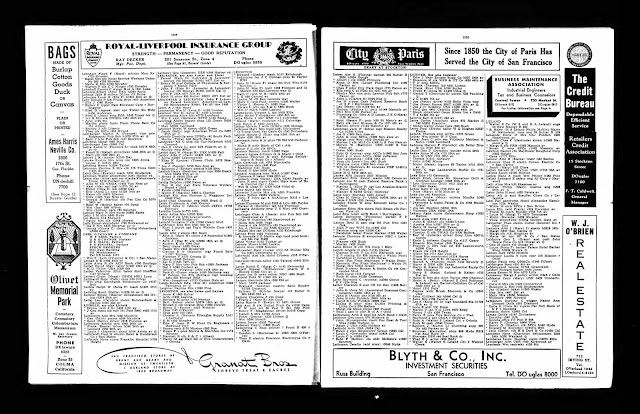 "U.S. City Directories, 1822-1995," indexed database and digital image, Ancestry.com (http://www.ancestry.com , : accessed 26 March 2018), California > San Francisco > 1945 > "San Francisco, California City Directory, 1945," page 1035, Lee S. Leland entry. In 1945, Lee and Edna (Schaffner) Leland resided in the house they bought in 1941 at 1726 47th Avenue in the Sunset District of San Francisco, only two blocks from the ocean. This is the house that my wife, Linda, grew up in with her parents and her brother. Lee Severt Leland (1911-2002) is my wife's father, who was born in Gardiner, Montana to Severt Oliver and Amelia Anna (Brocke) Leland. He married Edna May Schaffner (1913-1979) in 1937 in San Francisco. Edna was born in San Francisco to Paul F. and Edna C. (McKnew) Schaffner.